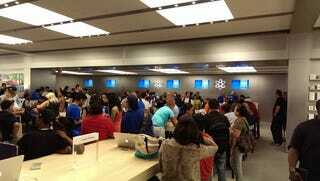 Apple's Hellish Stores and Steve Jobs "HELL NO!" on iPad Air. Surely there is a ring of hell saved specifically for the experience of shopping at an Apple store. I went in to purchase the new iPad Air yesterday. My son and my wife monopolize my iPad 2 so much it's never around when I want it. So, I told the wife, I'm getting another one and no one is allowed to use it except me. I head off to the Apple Store at 3:30 on a Friday afternoon, Greensboro, NC. When I get there, the place is jammed packed with older people as is typical, learning to do basic functions on their computers. Now, I'm not young, and my hair is graying enough to have been asked by a teen if I wanted to use my senior discount at the grocery store (I'm 46), but I've been around computers for more than 30 years and I don't need someone to teach me how to read email. I suppose those folks in the store could be Windows converts, but really, is it that hard to go from Windows to Mac if you only want to find email or set up email? Perhaps so, but out of about 30 blue shirts, only two were walking around without anyone around them. I approached one of the two blue shirts that weren't helping the old'uns, told him I was there to purchase an iPad Air. He informed me that he doesn't do that, but would log me into they're store waiting list. That pretty much infuriated me, but I kept my cool. I waited 5 minutes, which seemed like an eternity because there was hardly a place to stand quietly, and found the 2nd blue shirt person not waiting on someone. I went up to him and said, I just want to buy my iPad and leave. He said that I had only been there 3 minutes, but that was 5 minutes before I found someone just to log me in. According to blue shirt #2, there were 8 people ahead of me! At this point, it was difficult to contain my frustration, but I kept my mouth shut but my face spoke for me. I walked away, leaned against a table, waited and finally someone came out to take my order. I then waited, uncomfortably, with the blue shirt #3 while a "runner" went to the back to retrieve my iPad. Here are a couple of observations. Firstly, I noticed a lot of the blue shirts were older people, people my age and older, which surprised me. Its actually nice to see as I'm sure they know more about Apple computers than most of the younger blue shirters I've encountered there, including the geniuses, which at times don't seem to know that much. I've sat at that genius bar listening to them helping others and I've had to intervene a few times to correct a "geniuse's" guidance. My other observation, and recommendation to Apple, is to get a damn cash register in there so people like me, whom don't want to wait can simply buy our stuff and leave. I loathe going to the Apple Store as much if not more than Walmart, a place I try to avoid like herpes. Maybe rope off the store where you are teaching people from the rest of the store. Shoppers on one side, "dummies" on the other side. I don't like to sound so mean, but damn these people have no clue on how to operate a simple program on a Mac/iOS device and they are literally choking out people like me from coming to the store. I would have liked to have shopped for a couple of accessories while I was there, but NOT A CHANCE! I am NOT going to maneuver and dodge all the cattle plopped everywhere. I almost whipped out my phone to snap a picture of the chaos. This was a Friday afternoon! I thought it would be a safe time to shop. It's never a safe time to visit this ring of Hell. Apple should do something about this. I wonder how many people, like me, simply avoid the stores now because of all this "learnin'" going on? How many lost accessory sales do they have because of this type of chaos? I may take it back and exchange it for an iPad 4 if they still have these, I'll give it the rest of the weekend before deciding or I may just keep it rather than going back to that ring of Hell.